Finch is my son… He is three. Nothing makes me happier than watching him figure things out, especially when that comes in the form of creative play. 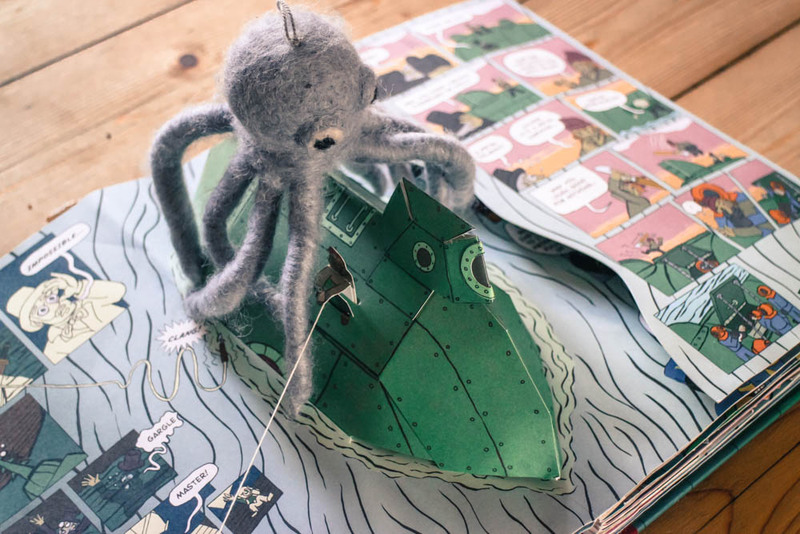 His favourite book at the moment is a pop up version of 20000 leagues under the sea. We keep it on a shelf, just out of reach and he usually asks for it at bedtime. As a lover of Joules Verne, i feel pretty proud that he’s taken a shine to it but it’s not really the original story that he loves about it. 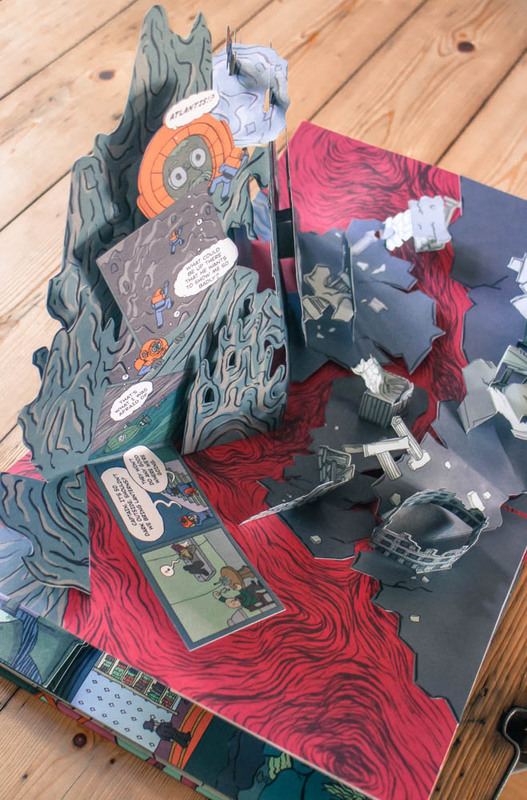 The story is far too complex and long for a bedtime story so instead we make up stories which follow the pop up scenes on each page. When we got the book for Christmas the story changed dramatically every night, usually a bit clunky and confused but some common story elements started to emerge. Some elements were driven by me and others by Finch. From me the sea evolved into Watermead Lake which is just up the road from home, so Finch knows it and I think deep down I want him to see it as a magical place where adventure begins, just as I do. Finch’s big addition is ‘Dave’ or more commonly “DAVE” the naughty octopus. So anyway, first Dave was a bad guy, just like the giant squid in 20,000 Leagues, I think this bad guy vibe was lead by me following the original story. This lasted for at least a few weeks as characters and locations changed, different objectives unfolded and eventually Dave started to say “goodnight” to Finch after he’d caused his chaos and “sorry for being naughty”. But at some point, the story took a U-turn. It happened when Finch asked out of the blue “Why are you crying Dave?” in response to this and without much thought, I said “because he’s not really bad, he’s just misunderstood”. This goes over finches head but this was the point that Dave’s character changed from a bad guy to a good guy! Dave wasn’t tearing people from the submarine to destroy them, he was actually rescuing them from a vessel trapped under the ice, fast running out of air. Dave was the hero who was actually helping us escape from peril. Interestingly this works with the visual story really well, and I started to think maybe the giant squid was just misunderstood after all. So now the story is still evolving but has pretty much rested on this idea of Dave being a good guy. For Finch this seems to work, he gets excited about seeing Dave and we call his name when we realise we’re trapped. Opening the hatch to reveal Dave’s big eye has a whole new meaning “DAVE!” is shouted with a different tone. Dave says goodnight, Finch kisses his pop-up face and holds onto his toy Octopus (another Dave) tightly as he goes to sleep. So what does all this mean? Why am I posting this here? As I’ve been discussing interactive and multi-narrative with everyone for the past few months I’m surprised this didn’t come to me before now. Some of the topics of conversation and internal debates I been having surrounding Vestige are being played out every night as we read this story. It’s not exactly how I’m expecting Vestige to work and there are lots of really key mechanisms which don’t relate at all to Vestige but there are some core principles at work. So looking at my experience with Finch, we have the constraints of the imagery to guide the story, but the ability to interact with the scenes and characters in a way that allows us to shape important story arcs throughout. I found the initial stages of the storytelling process to feel awkward and too open, I was unsure about how to make the story my own and the outcome, although fun, was ultimately not very fulfilling. The story stumbled and shifted and the climax was often pretty flat. This could be seen as the unrefined linear story, which needs reworking or as an interactive narrative that is too open or unguided putting too much of the narrative in the hands of the viewer. To multi-narrative or not to multi-narrative. On one side of the argument, you could say that all stories begin as multi-narrative and that the key role of the storyteller is to select the best options at each potential path to create the best story possible. Re-write after re-write, this is how the perfect story is formed. On the other side, you could say that when someone plays an active role in how a story unfolds, or at least feels like they have, then they have a richer experience of the story, the story in some way belongs to them. These sides of the argument aren’t so binary, there are lots of different flavours to multi-narrative that can give more or less influence from the viewer and there are even examples where the viewer isn’t aware of any influence they are having. My experience doesn’t immediately feel so ‘multi-narrative’ as we’re following a set path of existing imagery and there are no obvious branches from one place to another, but the moment Dave became good felt like a fork in the road. As this came after a few weeks, at a point when I was pretty comfortable with the storytelling process, it felt like a choice, not just changing the names or exploring Atlantis in a different way, but a real choice in where the story would go, how we would feel at the end. I knew that the Bad Dave option was good too, we had experienced his attack in a variety of ways, and his demise was a pleasure to behold. But Good Dave?! how would this one end? It was really a great moment, it felt exhilarating. So was this something that requires weeks of practice within a set of constraints to really break from the critical path and reveal new avenues? Or is this something that could be recreated in just one sitting? With more guidance or more constraints, could you create a well formed narrative whilst still maintaining the viewers sense of shaping the story? 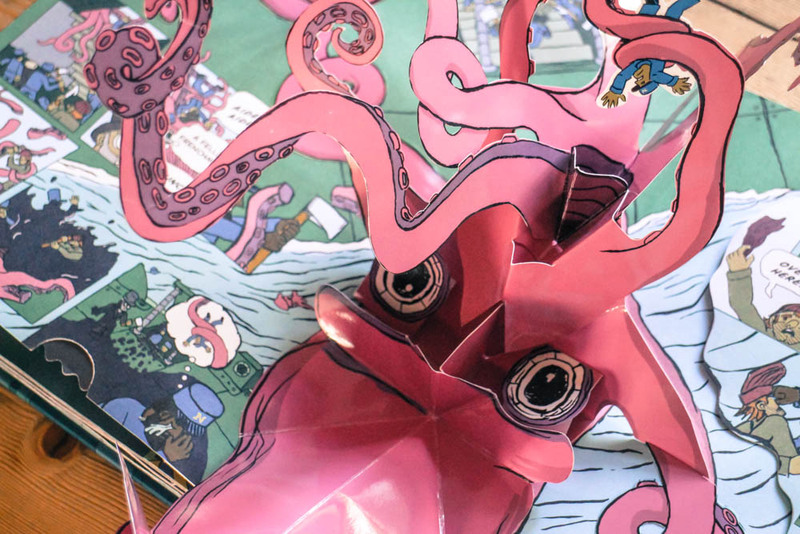 Dave the Naughty Octopus doesn’t have all the answers, but he did give me a glimpse into the world of interactive storytelling that makes me want to explore it more.